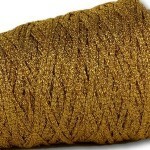 ?> A twinkly, metalic and glittery double knitting chainette yarn on a 50g cone. 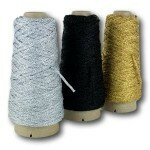 Available in a number of colours and perfect for craft projects that need a little sparkle. 50g cones of a very twinkly, lightweight double knitting glitter chainette yarn. 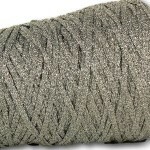 Sparkle DK is a double knitting chainette yarn made from a glittering combination of 55&percnt; viscose, 35&percnt; polyester and 10&percnt; nylon in a small range of classic metallic shades. &ast;Also available on 200g cones&ast; There&apos;s also a 4ply version. Unlike some glitter yarns, Sparkle is almost purely Lurex-like rather than a smooth viscose with just 20&percnt; Lurex, meaning that it is highly twinkly and reflective with a lightweight texture and a long meterage per cone. All chainettes are tubular with this DK version being wide enough to have a yarn or wire threaded through it. As it is wound onto the cone it also flattens to look like a wider ribbon yarn but this doesn’t affect how it is knitted or woven within a project. Sparkle is a really versatile yarn and can be used within almost all textile crafts to add a hint of twinkle to projects. For knitters and crocheters it can be worked to most double knitting patterns whether by hand or on a chunky gauge knitting machine. It is strong enough to stitch within plastic canvas work and needlepoint and can also be couched into embroidery projects. Whilst it won’t give great stitch definition it can be used within lacemaking and tatting and also adds glitz to tassels. Sparkle is quite strong, so with care could be used in the warp of most weaving projects, though it is a little slippery, so not ideal for a beginner. 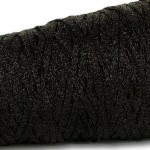 However, it is ideal for all types of weft applications including card weaving, tapestry weaving and tablet weaving. Of course it is a great yarn for anything Christmassy&excl; The length on these cones means you have plenty of yarn if you need a couple of rows of sparkle within a festive project, for decorating baubles, tying up gifts, cardmaking and scrapbooking. This repeatable DK yarn comes in a classic selection of metallic shades in a handy 50g cone, though 200g cones are also available for bigger projects.